The 1902 Empire Nephrite Egg, also known as Alexander III Medallion Egg unfortunately is one of the missing Eggs. The Egg was probably made of nephrite, gold, diamonds and possibly watercolor on ivory or mother of pearl. Thought to have been made of nephrite in the Empire style with a golden base and decorated with diamonds and a medallion portrait of the late tsar Alexander III. It is possible that the surprise from the Alexander III Medallion Egg was exhibited in Belgrave Square, London in 1935. The exhibition catalog mentions a "miniature of Alexander III by Zehngraf in a nephrite frame, lent by Her Imperial Highness the Grand Duchess Xenia of Russia". Unfortunately no images are known. A 2004 publication in Russian and English entitled, The 1902 Empire Nephrite Easter Egg by Fabergé, edited by Alexander von Solodkoff, suggested this Egg could have been found, however, the majority of Fabergé scholars did not accept this theory. A discovery revealed in May 2015 by Russian researcher Tatiana Muntian, of a description of an egg in a list drawn by the entourage of Dowager Empress Maria Feodorovna of her personal belongings from the Gatchina Palace in July 1917, re-heated the discussion on this Egg. Could "Egg in gold mount on two columns from nephrite, inside portraits Grand Duchess Olga Alexandrovna and Prince P.A. Oldenburg" really be an Imperial Easter Egg? The team who researched this egg thinks it is. They wrote a book: Fabergé: The Imperial "Empire" Egg of 1902, 2017 (Fabergé Tatiana F., et al). But again, opinions are divided. No doubt, to be continued! The Dowager Empress liked eggs as we can see from the photo below. 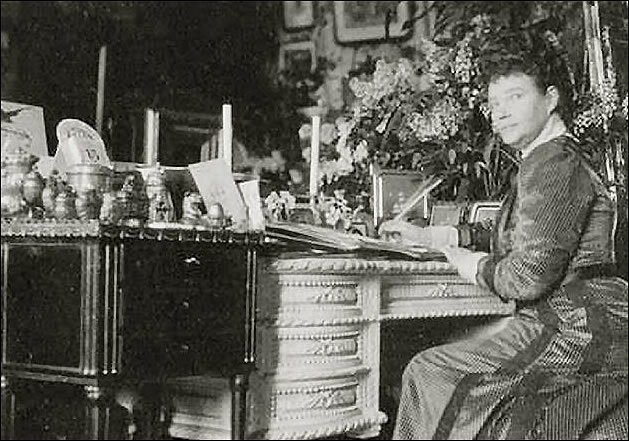 The photo was taken between 1914 and 1916 and you can clearly see several (non Imperial) eggs on the left of her desk.